Background: The World Health Organization (WHO) / International Society of Hypertension (ISH) risk prediction chart can predict the risk of cardiovascular events in any population. Aim: To assess the prevalence of cardiovascular risk factors and to estimate the cardiovascular risk using the WHO/ISH risk charts. Materials and Methods: A cross-sectional study was done from November 2011 to January 2012 in a rural area of Puducherry. Method of sampling was a single stage cluster random sampling, and subjects were enrolled depending on their suitability with the inclusion and exclusion criteria. The data collection tool was a piloted and semi-structured questionnaire, while WHO/ISH cardiovascular risk prediction charts for the South-East Asian region was used to predict the cardiovascular risk. Institutional Ethics committee permission was obtained before the start of the study. Statistical analysis was done using SPSS version 16 and appropriate statistical tests were applied. Results: The mean age in years was 54.2 (±11.1) years with 46.7% of the participants being male. On application of the WHO/ISH risk prediction charts, almost 17% of the study subjects had moderate or high risk for a cardiovascular event. Additionally, high salt diet, alcohol use and low HDL levels, were identified as the major CVD risk factors. Conclusion: To conclude, stratification of people on the basis of risk prediction chart is a major step to have a clear idea about the magnitude of the problem. The findings of the current study revealed that there is a high burden of CVD risk in the rural Puducherry. The present community based study has been conducted with objectives to ascertain the prevalence of cardiovascular risk factors and to establish the cardiovascular risk among the population of a rural area in Puducherry using the WHO/ISH risk prediction chart. The study was carried out in two of the four villages under the Rural Health Centre, namely Ramanathapuram and Pillaiyarkuppam. Open Epi Version 2.3.10 software was used to estimate the sample size. The sampling frame comprised of individuals aged above 40 years and single stage cluster random sampling was employed. All individuals aged >40 years were invited to participate in the study. However, those individuals who cannot be contacted despite three home visits or who were not willing to be a part of the study were excluded from the study. Also, individuals with a positive history of an atherosclerotic cardiovascular disease were excluded. Hence, total 570 subjects were finally included in the study. Each of the study subjects was interviewed using the piloted semi-structured questionnaire, after written informed consent was obtained from them. In addition, the participants were subjected to recording of blood pressure; anthropometry (viz. height, weight & waist circumference); and laboratory tests (viz. lipid profile, fasting and postprandial blood glucose) using standardized methods and tools. Institutional Ethics committee permission was obtained before the start of the study. Written informed consent was obtained from all study participants before eliciting the desired information. Data were analyzed using the SPSS version 16.0. Frequency and percentages were calculated for different study parameters. The Chi-square test was employed to assess the association between different variables at significance level (P value) of 0.05. The mean age in years of the study subjects was 54.2 (±11.1) with 46.7% of the participants being male. [Table 1] depicts the association between various study variables and the gender. A larger proportion of female subjects had never attended the school and were unemployed, in comparison with the male subjects. Although, abdominal obesity was more common among women than in men, however, no statistically significant association was observed. As already known, obesity is the result of a complex interplay of many factors. Though less proportion of samples were inactive and had high calorie intake, it is opined that the unhealthy dietary practices like white rice as a staple food, high salt diet, low intake of fruits and vegetables, frequent intake of fried food items and alcohol use in men were responsible for higher obesity prevalence in the study population. Distribution of study subjects with regard to cardiovascular disease risk on the basis of various parameters has been depicted in [Table 2]. Around 86% of study subjects had a very low risk of any fatal/non-fatal outcome in the next 10 years on using WHO/ISH risk charts alone. However, prevalence of low, moderate and high CVD risk in the men was 82.7%, 12.8% and 4.5%, as compared to 88.8%, 5.9% and 5.3% in women respectively. [Table 3] highlights the details about the prevalence of non-communicable disease risk factors among the study population. Most of the study subjects had a low calorie intake, nevertheless, salt intake was definitely on the higher side. Further, around 56.3% of participants had lower HDL level, while higher estimates were obtained pertaining to total cholesterol, LDL, and triglyceride levels. The prevalence of obesity, DM, hypertension in the South India has shown a definite rise in recent years. The apparent higher prevalence is also due to the inclusion of the population above the age of 40 years (because CVD risk charts are available for >40 year age only). The simultaneous presence of risk factors like smoking, diabetes, hypertension and high total cholesterol, resulted in a higher risk of a fatal cardiovascular event. Those subjects who were categorized as having the highest risk, had also a high prevalence of hypertension, and alcohol usage. However, subjects with moderate extent of risk were either tobacco or alcohol users and even had low serum HDL levels. Our study findings clearly indicate that the existing WHO/ISH risk prediction charts does not estimate the actual risk, as many of the risk factors like abdominal obesity, positive family history of CVDs, tobacco chewing, high salt intake, are not yet incorporated. Thus, it is of extreme priority to develop a risk prediction chart which should assess all the potential risk factors. The present study had some limitations. Cross sectional assessment of blood pressure may have overestimated the subjects with blood pressure persistently higher than 160/100 mm Hg. Also, because of the small sample size, findings of the study cannot be generalized. To conclude, stratification of people on the basis of risk prediction chart is a major step to have a clear idea about the magnitude of the problem. The findings of the current study revealed that there is a high burden of CVD risk in the rural Puducherry. Abegunde DO, Mathers CD, Adam T, Ortegon M, Strong K. The burden and costs of chronic diseases in low-income and middle-income countries. Lancet 2007;370:1929-38. Mathers CD, Boerma T, Ma Fat D. Global and regional causes of death. Br Med Bull 2009;92:7-32. World Health Organization. Prevention of Cardiovascular Disease: Guidelines for Assessment and Management of Cardiovascular Risk. Geneva: WHO Press; 2007. Available from: http://www.who.int/cardiovascular_diseases/guidelines/Prevention_of_Cardiovascular_Disease/en/index.html. [Last accessed on 2015 Jan 05]. World Health Organization. Cardiovascular diseases - Fact sheet N 317; 2013. Available from: http://www.who.int/mediacentre/factsheets/fs317/en/. [Last accessed on 2015 Jan 05]. Mackay J, Mensah GA. The Atlas of Heart Disease and Stroke. World Health Organization and Center for Disease Control and Prevention. Available from: http://www.who.int/cardiovascular_diseases/resources/atlas/en/. [Last accessed on 2015 Jan 08]. 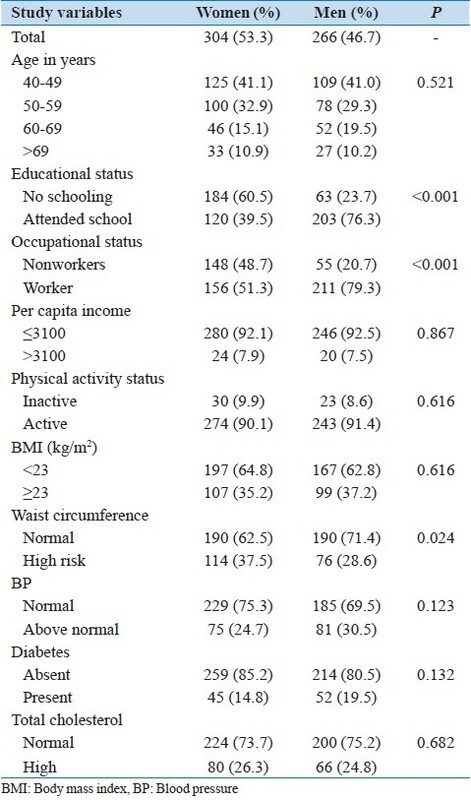 Chandola T, Plewis I, Morris JM, Mishra G, Blane D. Is adult education associated with reduced coronary heart disease risk? Int J Epidemiol 2011;40:1499-509. Saidi O, Ben Mansour N, O′Flaherty M, Capewell S, Critchley JA, Ben Romdhane H. Analyzing recent coronary heart disease mortality trends in Tunisia between 1997 and 2009. PLoS One 2013;8:e63202. Kar SS, Thakur JS, Virdi NK, Jain S, Kumar R. Risk factors for cardiovascular diseases: Is the social gradient reversing in northern India? Natl Med J India 2010;23:206-9. Samuel P, Antonisamy B, Raghupathy P, Richard J, Fall CH. Socio-economic status and cardiovascular risk factors in rural and urban areas of Vellore, Tamilnadu, South India. Int J Epidemiol 2012;41:1315-27. Kamble PH, Rode MV, Phatak MS, Tayade P. Is smokeless tobacco use a risk factor for coronary artery disease? A comparative study of smokers and smokeless tobacco users. Indian J Basic Appl Med Res 2011;1:22-30. Cooney MT, Dudina AL, Graham IM. Value and limitations of existing scores for the assessment of cardiovascular risk: A review for clinicians. J Am Coll Cardiol 2009;54:1209-27. Ndindjock R, Gedeon J, Mendis S, Paccaud F, Bovet P. Potential impact of single-risk-factor versus total risk management for the prevention of cardiovascular events in Seychelles. Bull World Health Organ 2011;89:286-95. Kuklina EV. Assessing and managing risk for cardiovascular disease: A worldwide perspective. North Am J Med Sci 2010;3:94-103. Mendis S, Lindholm LH, Mancia G, Whitworth J, Alderman M, Lim S, et al. World Health Organization (WHO) and International Society of Hypertension (ISH) risk prediction charts: Assessment of cardiovascular risk for prevention and control of cardiovascular disease in low and middle-income countries. J Hypertens 2007;25:1578-82. D′Agostino RB Sr, Vasan RS, Pencina MJ, Wolf PA, Cobain M, Massaro JM, et al. General cardiovascular risk profile for use in primary care: The Framingham Heart Study. Circulation 2008;117:743-53. Zhang XF, Attia J, D′Este C, Yu XH, Wu XG. A risk score predicted coronary heart disease and stroke in a Chinese cohort. J Clin Epidemiol 2005;58:951-8. Asia Pacific Cohort Studies Collaboration, Barzi F, Patel A, Gu D, Sritara P, Lam TH, et al. Cardiovascular risk prediction tools for populations in Asia. J Epidemiol Community Health 2007;61:115-21. WHO/ISH Risk Prediction Charts for 14 WHO Epidemiological Sub-Regions; 2007. Available from: http://www.ish-world.com/downloads/activities/colour_charts_24_Aug_07.pdf. [Last accessed on 2015 Jan 13]. Al-Lawati JA, Barakat MN, Al-Lawati NA, Al-Maskari MY, Elsayed MK, Mikhailidis DP, et al. Cardiovascular risk assessment in diabetes mellitus: Comparison of the general Framingham risk profile versus the World Health Organization/International Society of Hypertension risk prediction charts in Arabs - Clinical implications. Angiology 2013;64:336-42. Sawhney JP, Sawhney A. The total risk approach to prevention of coronary heart disease. J Prev Cardiol 2011;1:16-21. Ministry of Home Affairs, India. Census of India 2011. New Delhi: Office of the Registrar General and Census Commissioner; 2011. Available from: http://www.censusindia.gov.in/2011-prov-results/prov_results_paper1_india.html. [Last accessed on 2015 Jan 17]. Majgi SM, Soudarssanane BM, Roy G, Das AK. Risk factors of diabetes mellitus in rural Puducherry. Online J Health Allied Sci 2012;11:4. UNESCO. ISCED: International Standard Classification of Education; 1997. Available from: http://www.uis.unesco.org/Education/Pages/international-standard-classification-of-education.aspx. [Last accessed on 2014 Dec 22]. Ministry of Home Affairs, India. Census of India 2001. New Delhi: Office of the Registrar General and Census Commissioner; 2001. Available from: http://www.censusindia.gov.in/2011-common/CensusData.html. [Last accessed on 2014 Dec 19]. International Physical Activity Questionnaire. IPAQ Scoring Protocol; 2005. Available from: https://www.sites.google.com/site/theipaq/scoring-protocol. [Last accessed on 2014 Dec 19]. World Health Organization. STEPwise approach to surveillance (STEPS) field manual appendices. Geneva: WHO Press; 2003. Available from: http://www.who.int/chp/steps/en/. [Last accessed on 2014 Dec 19]. Rhem J, Room R, Monteiro M, Gmel G, Grahm K, Rhen N, et al. Alochol use. In: Ezzati M, Lopez A, Rodgers A, Murray C, editors. Comapritive Quantification of Health Risk: Global and Regional Burden of Disease Attributable to Selected Major Risk Factors. Geneva: WHO Press; 2004. p. 959-1108. Indian Council of Medical Research. Guidelines for Management of Type 2 Diabetes. New Delhi: Indian Council of Medical Research; 2005. Cooney MT, Dudina A, D′Agostino R, Graham IM. Cardiovascular risk-estimation systems in primary prevention: Do they differ? Do they make a difference? Can we see the future? Circulation 2010;122:300-10. Wassenberg MW, Willemsen JM, Gaillard CA, Braam B. Hypertension management in primary care: Standard care and attitude towards a disease management model. Neth J Med 2004;62:375-82. Erhardt L, Moller R, Puig JG. Comprehensive cardiovascular risk management - What does it mean in practice? Vasc Health Risk Manag 2007;3:587-603. Ferket BS, Colkesen EB, Visser JJ, Spronk S, Kraaijenhagen RA, Steyerberg EW, et al. Systematic review of guidelines on cardiovascular risk assessment: Which recommendations should clinicians follow for a cardiovascular health check? Arch Intern Med 2010;170:27-40. World Health Organization. Prevention of Cardiovascular Diseases - Pocket Guidelines for Assessment and Management of Cardiovascular Risk. Geneva: WHO Press; 2007. Mendis S, Lindholm LH, Anderson SG, Alwan A, Koju R, Onwubere BJ, et al. Total cardiovascular risk approach to improve efficiency of cardiovascular prevention in resource constrain settings. J Clin Epidemiol 2011;64:1451-62. Koju R, Gurung R, Pant P, Humagain S, Yogol CM, Koju A, et al. Prediction of cardiovascular disease in suburban population of 3 municipalities in Nepal. Nepal Heart J 2011;8:3-7. World Health Organization. Target 8: Provide Drug Therapy to Prevent Heart Diseases; 2014. Available from: http://www.who.int/nmh/ncd-tools/target8/en/. [Last accessed on 2014 Dec 19]. Shivaramakrishna HR, Wantamutte AS, Sangolli HN, Mallapur MD. Risk factors of coronary heart disease among bank employees of Belgaum city - Cross-sectional study. Al Ameen J Med Sci 2010;3:152-9. Singh RB, Singh V, Kulshrestha SK, Singh S, Gupta P, Kumar R, et al. Social class and all-cause mortality in an urban population of North India. Acta Cardiol 2005;60:611-7. Mora S, Yanek LR, Moy TF, Fallin MD, Becker LC, Becker DM. Interaction of body mass index and framingham risk score in predicting incident coronary disease in families. Circulation 2005;111:1871-6. Yadav S, Boddula R, Genitta G, Bhatia V, Bansal B, Kongara S, et al. Prevalence and risk factors of pre-hypertension and hypertension in an affluent north Indian population. Indian J Med Res 2008;128:712-20.